Without a doubt Africa has some of the world’s most exciting and interesting riding vacation opportunities in the world. 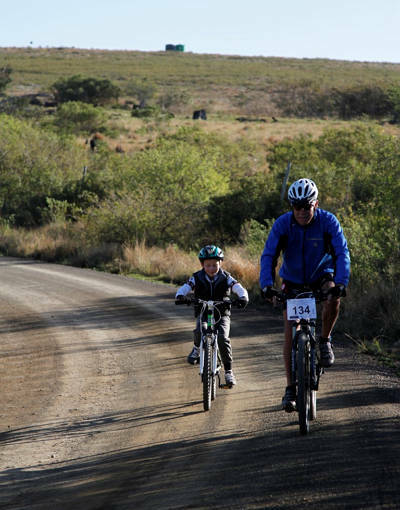 An African mountain bike riding at the Addo elephant park world’s best wild game country is an experience to be remembered for a lifetime. We build the tour according to your needs, running, riding, safari, spa en relaxing, we can make it happen. All about the different kind of tours for experienced and not so experienced mountain bikers. Flexibility is key word and the choice is yours : 3, 4 or 5 day trip. - 2,5 days of great mountainbiking. * You have the option to stay in one spot or moving daily. We have various accommodation options to choose from. Choose from various Guesthouses or a Full Bush experience - Luxury tents at Hayterdale. We can arrange Bike Hire if needed. The Addo Elephant National Park, with a surface area of 405 252 acres, serves as a sanctuary to a multitude of diverse wildlife species and abundant bird life. It is also home to the “BIG 7” – leopard, buffalo, elephant, rhino, lion, whale and shark. Upon your arrival in Port Elizabeth where you will be met by your tour guide and transferred (1,5 hours) to the Addo Elephant National Park. While on a game drive in an open top safari vehicle, one can see elephant, buffalo and ostrich, and, with luck, buffalo, rhino and lion as well. After breakfast we'll head out for our first ride, dropping down into the valley and flowing single track. On arriving at Hayterdale. We'll have a drink and something to eat and then it's your choice to ride the historic pas back home or wait to the shuttle to drive you back up. The afternoon is open for more riding or some time next to the pool and relaxing. We head out to Ann's Villa and will visit The Blacksmith Museum at Ann’s Villa. The contents of the museum contains all the original tools and machines and testify to the variety of tasks expected of a rural blacksmith. These ranged from fixing wagon wheels to branding cattle. We'll have lunch and continue the riding. Depending of the skill level of the group we can alter routes. Zuurberg Mountain Village is a haven of historical delight set high up on the Zuurberg Mountains. It is a tranquil & truly unique mountain top accommodation in Addo, set in 160 hectares of indigenous vegetation with breath-taking views overlooking the Addo Elephant National Park. Whether you are looking for the ultimate relaxing bush experience, or a fun-filled beach experience, Nukakamma Guest House is perfectly located to offer you both! Situated in the beautiful town of Colchester, Sunday’s river, we offer the perfect destination for your holiday. The fast-flowing water of the Sundays River, the endless white sands of the Alexandria Dune Fields and the close proximity of the Addo Elephant Park, provide the setting for the ultimate bush and beach experience at Nukakamma River Lodge.